Every care should be taken to assure that the amputation is done only when clinically indicated. 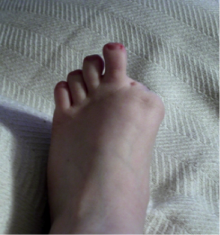 Amputation should only be considered if the limb is non-viable (gangrenous or grossly ischemic, dangerous, malignancy or infection), or non-functional. A well-planned and executed amputation can remove a painful, dysfunctional limb and allow rehabilitation with a prosthetic limb to a functional, painless state. 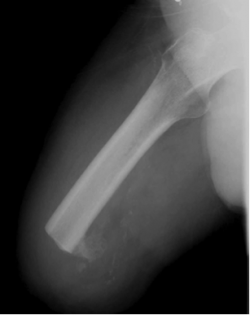 In this regard, amputation surgery may be considered reconstructive surgery, with results similar to amputation of an arthritic femoral head and prosthetic replacement (total-hip replacement). A decision to amputate a limb should be made through discussion with the interdisciplinary team - including the patient - wherever possible; in an emergency situation, the decision should be made based on medical need. 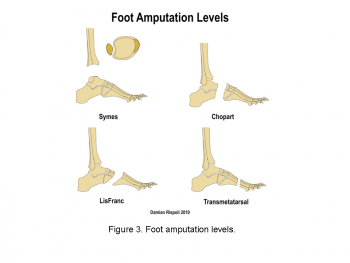 There are a number of different investigations that can be carried out to assess the need for an amputation; these examinations assess the bones and soft tissues to establish limb viability. In vascular disease these arteries can become blocked or narrowed over time which reduces the circulation to the legs; this can cause pain, ulceration and blackened areas. If left untreated this can lead to gangrene or infection and an amputation is needed to avoid this becoming life threatening. In trauma one or more of these blood vessels may be ruptured beyond repair due to the nature of the injuries sustained – e.g. in a car accident, gunshot wound or blast. 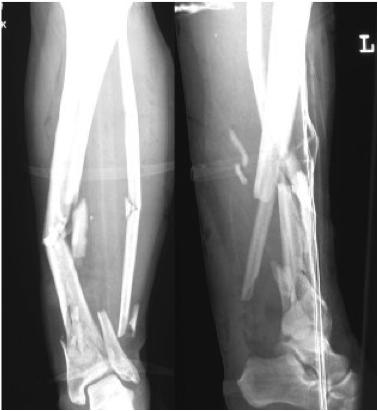 In this situation an amputation is performed as the limb does not have any blood supply beyond the level of injury and is therefore deemed non-viable. Myodesis: The muscle is secured to the bone by suturing the distal tendon via pre-drilled holes to the bone. 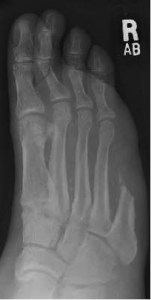 single ray amputations decrease the "structural integrity of the arch"
Tarsometatarsal (Lisfranc) - amputation of the forefoot at the tarsometatarsal line. 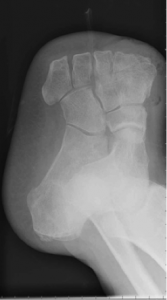 Mid-tarsal (Chopart) - amputation between the talus and the calcaneus proximally and the cuboid and the navicular distally. surgical techniques to prevent this deformity include Achilles Tendon lengthening and the "reattachment of the peroneal and anterior tibial muscles to the more advantageous biomechanical position"
This amputation is done through the tibia and fibula, measurements are taken and flap lines marked out. The surgeon dissects through the skin to then isolate and ligate the nerves and blood vessels. In order to minimise the risk of neuropathic pain (see complications) the nerves are dissected on tension so the end will retract back into the tissues where they can heal away from the stump end. 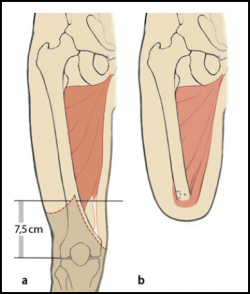 The tibia is dissected using an oscillating saw – optimum length of residual bone is approximately 12-17cm; the tibia should be beveled at approximately 45° to remove the sharp anterior edge, the fibula should ideally be approx. 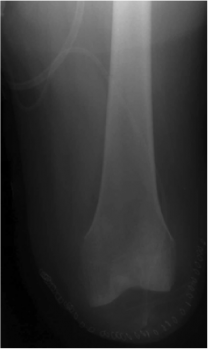 1-2 cm shorter than the tibia on a perpendicular axis. Preferred flap technique of surgeon is then used to close the wound and create functional stump - options include skew flap, long posterior flap, sagittal flap or medial flap. This video shows one example of how a transtibial amputation can be performed. This amputation is done through the femur, measurements are taken and flap lines marked out. The surgeon dissects through the skin to then isolate and ligate the nerves and blood vessels. In order to minimise the risk of neuropathic pain (see complications) the nerves are dissected on tension so the end will retract back into the tissues where they can heal away from the stump end. The femur is dissected on its perpendicular axis using an oscillating saw. 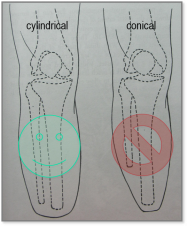 The optimum length of residual bone is approximately 7.5-10cm proximal to the superior border of patella. Very short trans-femoral stumps often end up in abduction because there is an imbalance between the adductor and abductor muscles. 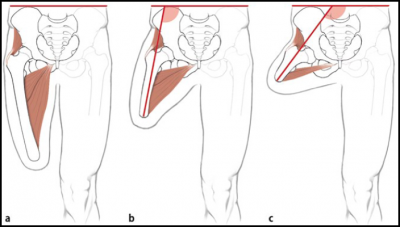 Very short trans-femoral stumps often end up in abduction because there is an imbalance between the adductor and abductor muscles. Hip disarticulation is amputation of the whole lower limb through the hip joint. 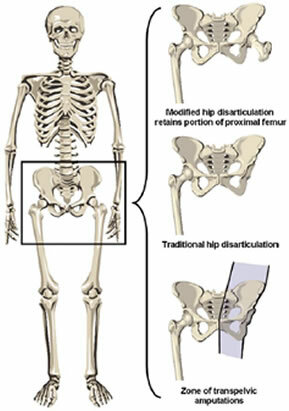 A traditional hip disarticulation is done by separating the ball from the socket of the hip joint, while a modified version retains a small portion of the proximal (upper) femur to improve the contours of the hip disarticulation for sitting. 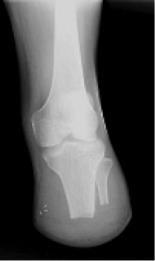 A hip disarticulation results most often from trauma, tumors and severe infections, such as necrotizing fasciitis (commonly referred to as flesh-eating bacteria). Less often, it results from vascular disease and complications of diabetes. Many are wheelchair users but can be considered for ischial tuberosity bearing prosthesis. 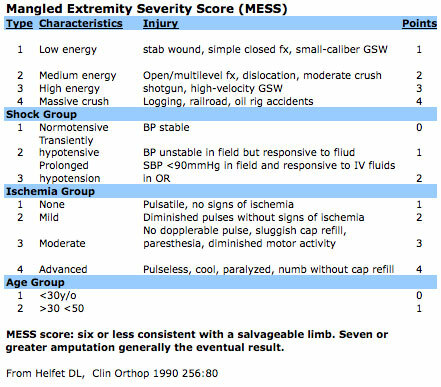 The risks for wound complications and mortality with this type of amputation is very high. 54% of all upper limb amputations are as a result of trauma; in comparison, only 3% of lower limb amputations are as a result of trauma. Upper limb amputations are seen more rarely than lower limb amputations. There are a range of different prosthetics available for the upper limb; these range from hooks to passive orthotics that might mainly serve an aesthetic purpose to fully mechanical and functional limbs. ↑ 7.0 7.1 7.2 7.3 7.4 7.5 7.6 7.7 Spires MC, Kelly BM, Davis AJ, editors. 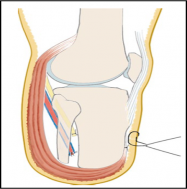 Prosthetic restoration and rehabilitation of the upper and lower extremity. Demos Medical Publishing; 2013 Dec 19. ↑ Douglas G. Smith. 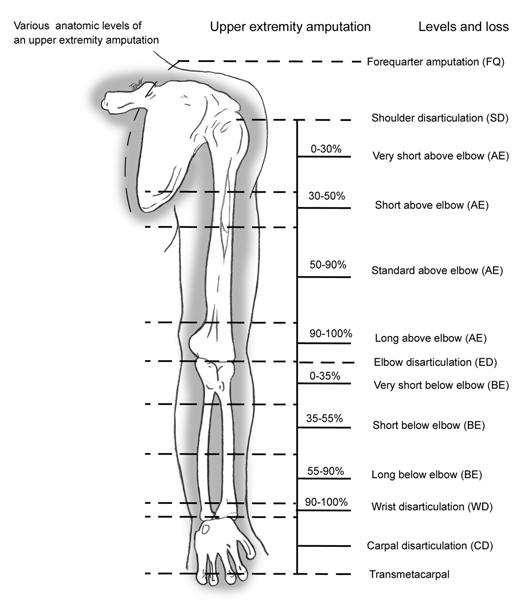 Higher Challenges: The Hip Disarticulation and Transpelvic Amputation Levels. inMotion, January/February 2005, 15(1). ↑ Robert E. Tooms and Frederick L. Hampton. Hip Disarticulation and Transpelvic Amputation: Surgical Procedures. Chapter 21A In: Atlas of Limb Prosthetics: Surgical, Prosthetic, and Rehabilitation Principles.